To view the original post by Chad Umble on LNP, click here. Melisa Baez, the director of the new Women’s Business Center at ASSETS. For Melisa Baez, 25 is a critical number. Baez, the director of the new Women’s Business Center at Assets in Lancaster, said she has the number posted near her desk so she can see it everyday. But it’s not her magic number. Rather, she sees it as kind of tragic figure, since it represents the percentage of businesses in Lancaster city owned by women. In her new job, Baez is working to boost that number by helping more women start businesses. “Now that we have this business center, we’re hoping to reach out to all types of women interested in entrepreneurship,” Baez said. The Women’s Business Center, officially launched last week, is funded by a five-year grant from the U.S. Small Business Administration worth $150,000 a year. Formerly hosted by the Community First Fund, the Women’s Business Center offers seminars, mentoring, counseling and other resources for women who want to open or run a business. “It existed before here in Lancaster, and we wanted to keep it. 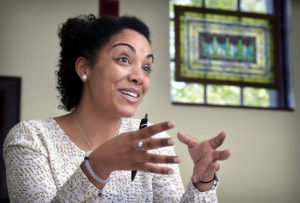 We feel like there’s a huge benefit and a need for the resources of the Women’s Business Center here in Lancaster,” she said. With its initial focus on low-income women in the city, Baez said she hopes the center can expand soon to help entrepreneurs in the wider region. The center also helps men who want to become entrepreneurs, but tries to ensure that 70 percent of its clients are women. The 30-year-old Baez previously worked for the local nonprofit Children Deserve a Chance and was also the co-founder of Attollo, a college-prep program for city students. In November, Baez began a two-year term on the board of The Lancaster Chamber of Commerce & Industry. What kind of entrepreneurs do you help at the Women’s Business Center? We’re not just looking at the startup. We’re looking at different levels of business success. We’re looking at executives. We’re looking at a three-year startup and people in the idea stage as well. We’re trying to form our program to be able to touch all levels of business. What are some challenges for your clients? With women, they’re mothers, they’re young. About 40 percent of our population is Latino. They’re the most underrepresented people here in Lancaster, and we want to make sure that we’re able to serve that community. With the clients that we get, child care tends to be the biggest issue: balancing their home life with what they want to do professionally. Not only are they working a full-time job as a parent, but also just as a caregiver for the home. That just tends to be the biggest issue. When we have a client who comes in, we work with her one on one first. We like to have a session where we really get to know her as an individual. We like to hear where the idea came from, what was the inspiration. If you’re coming in and you have an idea for a salon, that’s a very saturated industry here in Lancaster. So what is it about what you’re going to do that is different? Do you dissuade people from starting their businesses? I don’t think we’ve ever discouraged someone from building off an idea, but we want to paint a really realistic picture. We’re not in the business to just inspire an idea or to help build on an idea. We’re here to make it a reality, or else we wouldn’t be doing our clients or Lancaster any justice. Catering seems to be one of the most popular ideas that comes in, but we want to make sure they’re thinking about what it is they’re going to be doing differently. Is there a cost for your learning circle workshop? It’s $100 for the full 10 weeks of learning about business and building a business plan. We do offer scholarships. We found through our programming that people become more invested when they have some of their own investment in the program, which is why we charge at least $100 for a 10-week program. We’re not using capital yet. That’s part of our long-term goal. Right now it’s resources and training. Do you see some real opportunities for women in business here? Absolutely. If we look at the trends here in Lancaster, there’s potential. The great thing about women entrepreneurs is they also have a heart for giving back. And it’s just about making sure they have access to capital and that they understand the technical side of building a business. What does it mean that the center is housed at Assets? Assets is one of the most innovative, progressive nonprofits working with businesses here in Lancaster, and we’re taking on that culture. We’re working with minorities, people of color, and we’re makings sure they’re thinking out of the box. To keep the Assets culture, obviously we’re a huge social-enterprise mission. We’re trickling that into the Women’s Business Center as well to make it a little different and unique. If we’re getting people through our door, I know we’re doing something right. The way that we really measure our success is how full our seminars are, how consistent and dedicated our clients in our training programs are. How many of them actually start their businesses? And if we’re working with people who have businesses, how many jobs are they creating? That’s how we see our outcomes and our success.